Once again at the start of hostilities the railways came under Government control. At first there was something of a panic -the "phoney war" - and savage cuts were made in services: from 1st November 1939 the L.N.E.R. reduced its services from London Road to Marple from 32 to 20, and on the Macclesfield line from 13 to 8, while all but one of the Rose Hill turn-backs were withdrawn. These cuts were later seen to be somewhat excessive, and even by the end of the war more services were running than in late 1939. 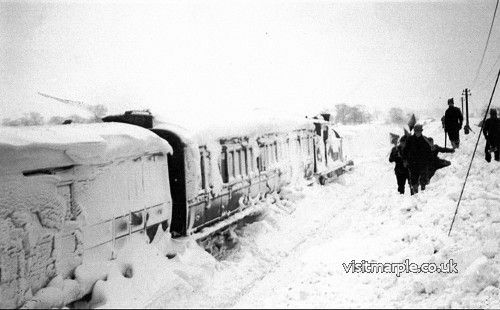 Soldiers help to clear the line at Rose Hill Station in February 1940. The L.M.S. at the outbreak of war swept away the last remnants of the Midland line through coaches serving Marple, most of them never to re-appear, leaving a basic minimum service of 9 Up and 8 Down trains by 1944, all of them locals between Central and Chinley, Sheffield, Buxton or Derby. The Marple-Stockport shuttle, as well as the L.N.E.R. Macclesfield-Bollington shuttle also disappeared forever. The L.M.S. total of 35 trains in 1938 was down to only 17 by 1944. All told only 61 L.N.E.R. and L.M.S. trains called at Marple in 1944 compared with 94 in 1938. Trains that did run were overcrowded, dirty and often hopelessly late; posters everywhere invited you "to give up your seat to a shell", and demanded "Is Your Journey Really Necessary?" The war also brought the blackout; as the railways were particularly vulnerable to attack and at the same time vital, great precautions were taken. For instance the glass of the roof canopies at Marple, along with many others in the area, such as Belle Vue, were covered with tarred hessian to prevent any light from being seen from enemy aircraft. This filthy black stuff remained on some of the glass panels until the roof was removed. The blitz, as far as I know, had little effect on Marple itself, but Manchester was badly bombed. On a more amusing note, a barrage balloon straying somewhat from its proper position, dislocated working at London Road for twelve hours with its trailing cables! 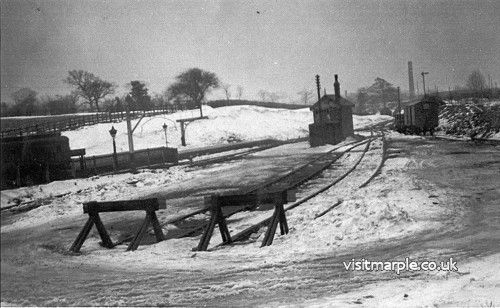 Snow in Marple - January / February 1940. Rose Hill Station. The locomotive and rolling stock were once again requisitioned, repair works turned over to munitions, staff conscripted, and the railways called upon to carry unprecedented amounts of traffic. When peace came after six years of war, the railways were in a sorry state, far worse than 1918, with stations and bridges bombed, repairs to locos, wagons, carriages and track in hopeless arrears due to shortage of men and lack of materials; nor were the railways rewarded any better for their efforts than they had been in 1918; if anything worse, as the Labour Government of 1945 was determined to stifle any charges of "profiteering". With a Labour Government returned to power in 1945 large scale Nationalisation was embarked upon. Despite very vigorous campaigns by the "Big Four" Railway Companies against nationalisation, the 1947 Transport Act authorised the state take-over of all heavy land transport, under the "British Transport Commission", with a "Railway Executive" to manage the Railways. On 1st January 1948 the L.M.S. and L.N.E.R. along with the Southern and Great Western Railways ceased to exist, and the newly unified, state controlled system was titled "British Railways" (B.R.). The network was divided into six Regions; most of the L.M.S. outside Scotland became the London Midland Region (L.M.R. ), while the L.N.E.R. South of the Humber became the Eastern Region. It was not however until the end of 1948 that the C.L.C. was finally dissolved, after 83 years of existence. At first Regional boundaries followed the old L.M.S./L.N.E.R. divisions and were correspondingly chaotic, as the two railways had overlapped a good deal, especially with the G.C. in the North West. Former joint lines such as the Marple and Macclesfield lines were even more of an anomaly, but were soon assigned to one Region or other; the lines in our district became part of the London Midland Region, along with the L.M.S. ex-L.N.W. and Midland lines. Soon locomotives began appearing in the district bearing the legend "British Railways", and in the newly adopted standard livery of black, lined out red and cream, which was adopted for all but express passenger locomotives. Various trial liveries for the latter were tried, with the ex-G.W.R. Brunswick green being the eventual choice, but such engines were a rare sight on our lines. In about 1950 a new livery for coaching stock was introduced consisting of red lower and cream upper panels, but this did not last long; it was replaced in the mid-50's by a version of the old "Midland red" for all coaching stock (except diesel and electric multiple units), though the quality of the paint, like the cleanliness of the coaches, had deteriorated a lot since Midland days. The L.M.R. also adopted a sort of maroon as the Regional colour for use on station signs, publications etc. In the early to mid-50's this maroon was used on enamel station name boards which were designed with distinctive "double sausage" shape (officially known as "Totems") and the "Sans Gill" style of lettering favoured by the former L.N.E.R. These were put up at all stations in the district, and replaced the signs put up by the L.M.S., which were of cast iron, and of the "bar and circle" shape. These had originally been painted with a sort of yellow reflecting paste, which, with the name and border picked out in black, were meant to make the signs visible at night. These L.M.S. signs erected in the 30's had in turn replaced the old Midland type station name boards, with cast iron letters screwed onto wooden boards, which were mounted at platform ends in pairs, each at an angle, so as to be visible from the side as well as face on. The Midland and L.M.S. had only placed station name boards at the ends of platforms, but B.R. placed the new "Totems" on lamp-posts and roof pillars the whole length of the platform, as well as providing a large sign at the end, giving a much better level of information. At the same time matching maroon enamel "Way Out", "Waiting Room" etc. signs were put up to replace the old Midland wooden signs. Soon after the formation of B.R., the process began at the grouping of adding suffixes to distinguish separate stations serving the same place was continued. The two Middlewood stations became officially Middlewood Higher and Lower while the G.C. and Midland stations at New Mills and Reddish were titled "Central" and "North" to distinguish them from the L.N.W. "Newtown" and "South" stations in the same place. But for many years after the war, "Austerity" was the watchword, and with coal and especially steel in short supply for some years to come, it was not until the early 50's that B.R. could even think of restoring something of the level of pre-war services; by which time, as in the 20's, it was too late and much traffic, both goods and passenger, was irrevocably lost to the roads. The number of road goods vehicles reached one million in 1952, the cheap motor cars became commoner and commoner, and foreign oil poured into the country. Meanwhile the war-battered railways, laboured on with old equipment, increasing costs and wages, and receipts that did not keep pace. B.R. made their first deficit of £1 .8m in 1955, and attempts began in earnest to reduce costs by closing less used stations and lines. Around Marple for instance, Bugsworth closed in 1958 and Middlewood Higher in 1960. Middlewood's interchange function was much less than formerly, and Cooper's Hollow out of favour as an Excursionist's resort. What is more the Down platform of the Higher station had been swept away by the collapse of the embankment in the early 50's, and had beep replaced by a short 3 coach length wooden platform. The Lower station however continued in business, though only for the very meagre local traffic. The Middlewood Curve finally closed to goods trains in 1955, and a further foretaste of things to come was given when Reddish North closed to goods in 1957 - road competition was now really beginning to bite. Station staffs were also reduced for economy, and at Marple some of the ticket collectors and porters were withdrawn; later on the clerical staff in the Goods Office were cut out, this work being transferred to the Booking Office. 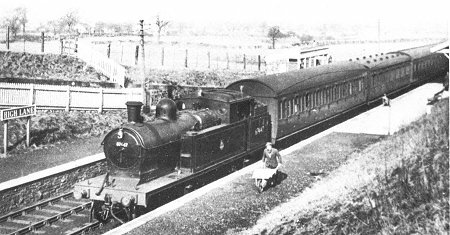 Smaller stations such as High Lane lost their Station Masters, and one man now supervised several stations - in this case the Station Master at Rose Hill took over High Lane. To show how slow recovery was after the war, one has only to look at the 1952 timetable; there were only a couple more services between London Road, Marple, Hayfield and Macclesfield than in 1944, after five years of war. In 1952 only 18 Midland Main Line services called at Marple compared with 17 in 1944 - or 38 in 1938. Surprisingly one Midland Main Line train was still routed via Marple, the 3.22 p.m. ex Liverpool Central Buffet Car Train to Nottingham via Manchester Central, Marple and Derby. But for the rest, the trains were all locals between Central and Chinley, Sheffield, Buxton or Derby, and the service to and from Central and Stockport Tiviot Dale was very poor. There had been a slight improvement on the Macclesfield line with an extra Manchester to Macclesfield train and 2 more Rose Hill turn-backs each way compared with 1944. But in 1952 the level of service on all fronts was below that of 1938 and little better than 1918: it was just not possible in the motor car era to attract enough passengers to such infrequent and inconvenient services, and patronage slowly declined. 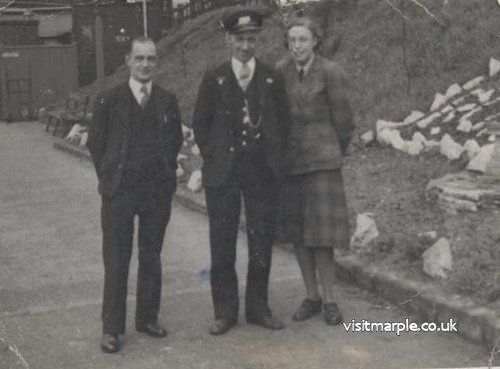 Rose Hill Station Master Sid Grant, Leading Porter Jim Noble and Booking Clerk Mary Baron, c.1949. In the late 40's, and early 50's many of the carriages on our lines were pre-war - pre-1st war, in many cases - and just not up to modern standards. Eventually newer, steel bodied coaches with efficient heating and lighting, bogies for better suspension, and in some cases corridors and lavatories, which had begun to appear in the 30's on L.M.S. trains, became the norm - but none too soon. 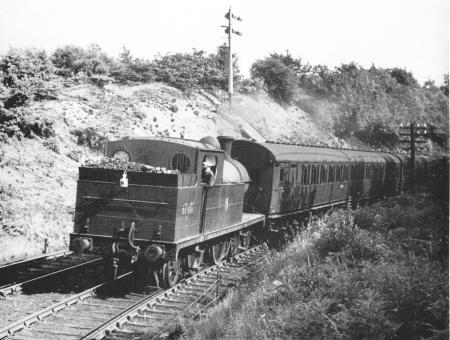 Suburban services from London Road in the early 50's were usually hauled by a variety of tank engines of G.C. origin, such as the Class C13 and C14 44-2T's and the AS 46-2T's, now forty or more years old. On the Midland line services the old Main Line "Compounds" or the "2P" class 440's of Midland build were the staple of motive power, though the new B.R. standard class SMT 460 steam locos were occasionally seen at Marple on running-in turns after being built at Derby works. On goods trains Stanier L.M.S. standard 2-6-0's were common, though older Midland 0-60's were still much in evidence. But it was now proving difficult to get staff to maintain and clean locos, and obtain coal suitable for raising steam, with the result that steam engines were usually very dirty. Travel by train was increasingly seen as dirty and old fashioned by comparison with the roads and airways. On some lines such as the Manchester South district which had once been very busy, the service had become so' poor that patronage declined to the point of no return, and in desperation B.R. closed stations at Heaton Mersey and Withington (in l96l) which of course only made matters worse. It was already apparent in the mid-50's that unless something was done, the whole system was in danger. There had already been some modernisation in the district; in the late 1930's the L.N.E.R. had intended to electrify the Woodhead route to Sheffield and there had been talk of extending the wires to Marple and Hayfield; but the war put a stop to these plans. B.R. revived the Woodhead scheme, and in 1954 the line was opened to electric traction throughout -the first electrified passenger and goods Main Line in Britain. Glossop and Hadfield also got a frequent electric suburban service. With the quite obvious decline in the railways in the 50's the Government decided in 1956 to implement a Modernisation Plan. The aim was to re-equip the railways to enable them to compete more effectively and work more efficiently. The plan included large scale replacement of steam locomotives by diesel railcars for local work, and diesel locomotives for freight and main line work, with the eventual aim of electrification. A start was to be made with the electrification of the ex-L.N.W. main line from London Euston to Manchester and Liverpool via Birmingham, Crewe and Stoke. While this work was under way, virtually all the Manchester-London traffic was diverted via the Midland route. But in April 1966 the full electrified service was introduced between Euston and Manchester, which sounded the death-knell for the Midland route; the Central-St. Pancras service immediately dropped from 8 trains each way to 4, and was henceforth mainly for the benefit of intermediate stations. In conjunction with the Euston electrification, Manchester London Road Station was reconstructed, and not before time, as it was chaotically laid out; both G.C. and L.N.W. had each had a virtually separate station, with a great iron railing between the two where platform 5 now is: L.M.S. and L.N.E.R. had perpetuated this dichotomy. Added to this were the quite separate M.S.J.A. through platforms, and beyond them the annex of Mayfield, built in 1910 as a relief to the L.N.W. side of London Road. With Nationalisation the station came under one management, but remained a shambles. In the reconstruction, only the roof of the old station was left, the platforms completely re-arranged and the frontage rebuilt. Main line services were diverted to Central, Exchange and Victoria, while local trains were in chaos, departing from any platform but their normal one. During this, a porter when asked what platform the such-and-such train for Hayfield went from, replied "Don't know: that's the L.N.E.R. line - don't even know the stations on it" - old loyalties died hard! Eventually the work was completed, and there were now 12 terminal platforms (compared with 9 before) and 2 through platforms for the M.S.J.A. service. The Marple, Hayfield and Macclesfield services however continued to leave from the old G.C. side, under the northern-most span of the roof, now platforms 1 to 4. The station was renamed "Piccadilly" in 1960, though this was well before reconstruction was finally completed in 1966, giving a much improved terminal for long distance passengers as well as for local passengers from the Marple lines. At the same time it was decided to concentrate passenger traffic in Macclesfield on one station - at last. Central Station was re-built in 1960 for the electrification and thereupon became Macclesfield's Main, the only station, with the closure of Hibel Road. Thus at last Main Line connections were available at Macclesfield for the line to Rose Hill, and a special platform was provided for the M.B.M. line trains; excellent connections with the electrified service gave a best ever timing of well under three hours from London Euston to Marple (Rose Hill) and other places on the line, but this facility was never publicised at all. Meanwhile, our lines too were benefiting from modernisation. On 17th June 1957 the first diesel passenger trains appeared on the Hayfield and Macclesfield services in the form of "diesel multiple units" (d.m.u. 's); the sets originally used were the "Derby Lightweights", which as the name implies were built at Derby, and were of light construction. After about a year, these were transferred to the Eastern Region, and former North Wales sets used on the line; which is why for many years trains used to arrive at Marple with a destination blind occasionally showing such bizarre destinations as "Afonwen" or "Bangor", when the driver had forgotten to set the blind correctly! The sets consisted of two cars, with a driving cab at one end of each car, which was ideal for suburban work, as it was no longer necessary for the train's engine to run round at the terminus. At one end was a first class compartment with twelve seats, and there was a sizeable guards van in the middle with ample room for parcels, prams and bicycles. The rest of the train was given over to 2nd class accommodation in open saloons, with a central gangway between bus-type seats all facing the same way. Capacity was much greater than in conventional stock, yet without a reduction in comfort. Originally they were painted green, but from 1967 appeared in the new B.R. standard turquoise blue, at the same time as the Main Line coaches were changed from maroon to a blue and grey livery. It is difficult to imagine the impact of the d.m.u. 's in 1957 when we see them 20 or more years later much worse for wear; but they were originally very popular, and considered airy, spacious and comfortable; especially popular was the fine view through the many windows particularly forward through the driving cab. The d.m.u. 's displaced the ex-G.C. 'C.13' and 'C.14' 4-4-2 and 'A.5' 4-6-2 Tank engines from the bulk of the workings on the line, and at the same time Gorton Shed received an allocation of 'L.1' 2-6-4 Tanks of more recent L.N.E.R. build from the King's Cross suburban lines in London to work the remaining steam-hauled services, which were mainly in the rush hour, when the d.m.u. fleet could not cope. In 1960 Gorton went "Midland", and the Stanier Class 4 Mixed Traffic 2-64 Tank engines, displaced by diesels from other work, were allocated to the remaining steam services. The last regular steam-hauled service was the 08.10 "express" from Marple to Manchester, and 17.20 return service, which was usually 8coaches. Attempts were made to dieselise it on several occasions but it was too long and heavy a train. However by 1966 the number of passengers had declined - the private car being largely responsible - and it was possible to use an 8-car d.m.u. on the train. Dieselisation was accompanied by a great increase in the number of trains run, as more efficient use of the coaches could be made due to the ease of reversal, and this stimulated usage. 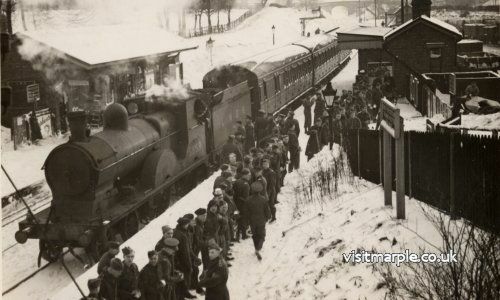 In 1955 the services on our lines were little better than they had been in the war, with only 35 departures daily from London Road for the Marple, Hayfield and Macclesfield lines, compared with 48 in 1938; after dieselisation this figure had risen to 57 by 1958. The basic pattern of services, was one train an hour via Bredbury to Hayfield, and one an hour terminating at Marple, giving Marple a half-hourly service; there were of course additional trains in the peak. In the 1961 winter timetable, there were 42 weekday trains from Marple to Manchester and 41 in the other direction; of these about half ran to and from Hayfield, one or two terminated at New Mills, and the rest turned back at Marple. This was undoubtedly the best Manchester service Marple had ever had, having the additional advantage of being on a regular basis instead of irregular as before. 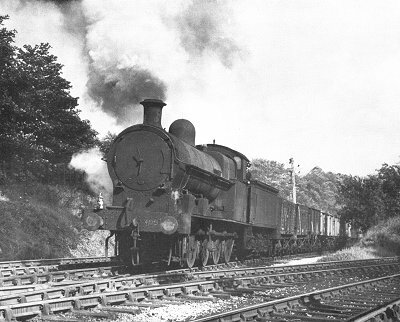 The basic Midland line local service continued at 9 trains each way, making a weekday grand total of 102 trains calling at Marple, which almost equalled the all time high of 109 in 1898. L.N.W. "Bowen-Cooke" 7F.0.8.0 No 49093 gets the road through Marple Wharf Junction with a down coal train in August 1956. Note the Macclesfield line joining from the right (E. Oldham). In the late 1950's, as they were displaced from Midland Main line turns, the Stanier Mixed Traffic Class 5's ("Black-Fives") and "Jubilee" express engines appeared on Midland line local turns displacing older engines such as the Compounds; additional interest was provided for many years on Sundays when all Main line trains were diverted via Marple to permit repairs to Disley Tunnel, bringing premier Main line classes of locomotives such as "Royal Scots" and "Britannias" through the station. However diesels appeared in increasing numbers from the mid-50's onward, and the line was used to run in the new Main Line Class 44 and 45 "Peak" class locomotives from Derby Works, and as a test ground for the ill4ated "Fell" experimental diesel. After that the "Type 2" Metro-Vic diesels, followed by the Class 24's settled down to form the mainstay of the local Midland line services, except for a few which remained steam-hauled. Unfortunately, despite dieselisation, the Rose Hill and Macclesfield service remained irregular; with 15 trains each way, and several more terminating at Rose Hill, there was at last some improvement on the wartime level, but the improvement was not as dramatic as the Marple line, especially as most trains were via the slower Guide Bridge route. As a result usage did not grow as it should have done, and especially south of Rose Hill dwindled. While the usage of Marple and Rose Hill Stations on the whole remained steady, and even rose, that of Strines, Middlewood and High Lane declined, due to their unfortunate siting. The 50's saw a vast increase in private car ownership, and the buses were still taking passengers from the railways due to their lower fares, so the general state of the railways continued its slow decline. Goods traffic, particularly general merchandise, was also dwindling in the 50's, leaving coal as the staple of most of the goods yards in the area; however coal too began to decline, as gas and electric fires, and even oil central heating in later years, replaced coal, and "smokeless zones" extended. Even so at Marple there was enough livestock traffic in the early 1950's to make B.R. consider installing a proper siding for livestock with pens on the site of the second turntable, to serve the cattle market.